327. That’s how many species I ended up getting. Among active county users of eBird I finished in first place, one bird ahead of Mark Holmgren, whom I suspect could have beaten me if he’d tried, but who probably didn’t realize it was a contest. The only times I really made up ground on him are when he was on extended birding trips away from the county. The one-year record for Santa Barbara County is 358, set by Wes in 2008. I finished well short of that, and looking over the list he got that year I doubt I could get into that range, at least in my current state of bird knowledge. Someday, maybe. I recorded at least one eBird checklist every day last year; at the moment my streak (which I’ve kept going) is at 382 days. 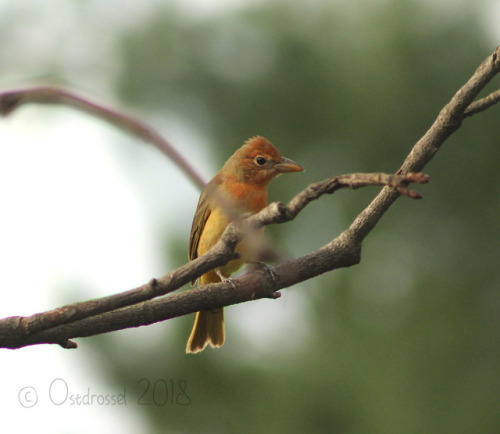 A few times when I was sick I only did a 10-minute count in my backyard, but I always got at least one birding session in. I made a few brief trips to the Eastern Sierra during the year, and on my long-commute days was sometimes reduced to entering a 2- or 3-species list while walking to Starbuck’s through the bird desert surrounding my employer’s office in LA, but other than that it was all Santa Barbara county. I finished the year with 730 checklists entered in the county; the next highest total of checklists submitted was (again) Mark Holmgren with 547. Fun facts: I had 845 checklists total entered during the year, including those outside the county, which ranks me 484th among active eBird users in the ABA area (North America north of Mexico). I’m not aware of any way to compare my single-county species total with those of other eBirders, but I think I’d probably be toward the upper part of that list, Santa Barbara being such a good county by ABA standards. But I dunno; there are a lot of counties, and a lot of birders more obsessive than I am. My species total for the ABA area was 350, which ranks me roughly 14,000th among active eBird users in 2018. 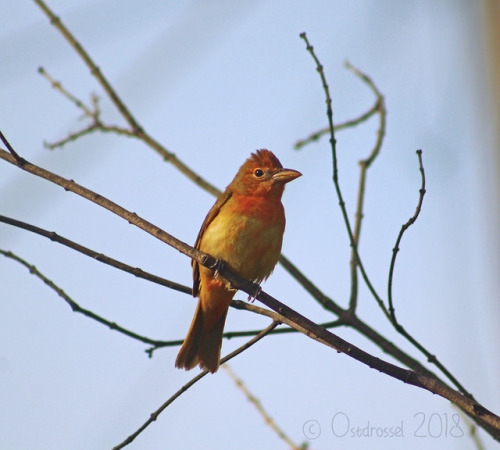 Tops in 2018 in the ABA area in eBird were Nicole Koeltzow with 775 species, which is amazing, and Barbara Combs with 11,147 checklists submitted, which is also amazing. Barbara averaged slightly more than 30 checklists per day in 2018; some poking around shows that she’s opting for maximum granularity; my guess is she’s basically entering a list of the birds seen in every 15-minute chunk throughout the day, every day. Birds are not evenly distributed in the landscape. I mean, I knew that already. But now I appreciate it more. They’re really out there (those rare/difficult species I’d always seen in the field guide but never in person) — except when they’re not. Finding is better than chasing. 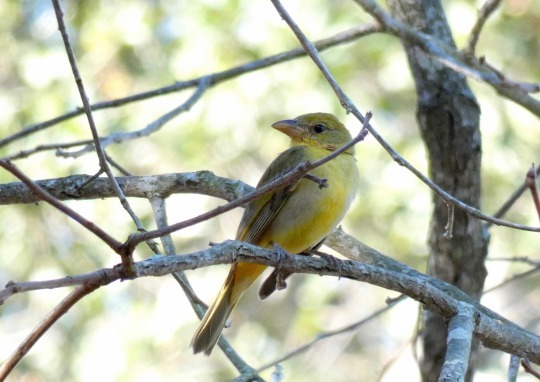 Different kinds of birding are their own discreet knowledge domains. I was a beginner at most of them; still am at some. But I’m learning. So many rungs on that ladder. I’m a way better birder than I was at the start of the year, but I’m more aware than ever of how far below the real experts I am. Avid birdwatchers are a flash mob waiting to happen. All it takes is a report of a rarity (”Mississippi Kite at Alisal Ranch!”) for them to suddenly coalesce. I now know most of the top 20 people in the county eBird rankings from last year, but when I started they were just names. That’s almost all from hanging out with them at the site of reported rarities. eBird is the best. I love eBird. 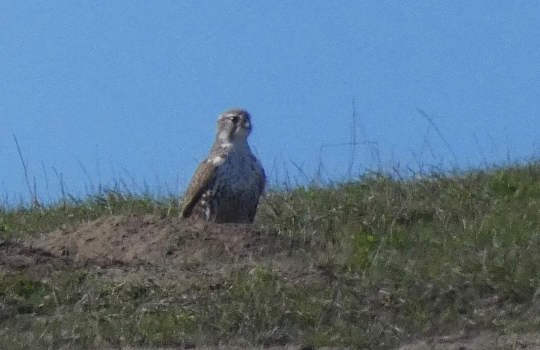 Favorite bird I saw this year: Prairie Falcon. I saw this species first outside the county, on March 30, during one of the trips I made to the Eastern Sierra. 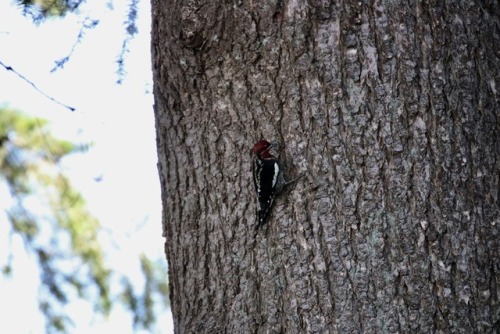 I first saw it in the county during the birding trip I made to the Cuyama Valley on April 29. I also saw it once on Lake Cachuma, and once along Happy Canyon Road north of Lake Cachuma. But the place I saw it the most, on four different visits, was the place I’m going to talk about next. I appreciate all the nice comments people have made about my silly obsession this past year. If you have any questions I’d be happy to go on (and on) about it some more; the Ask Box is always open. 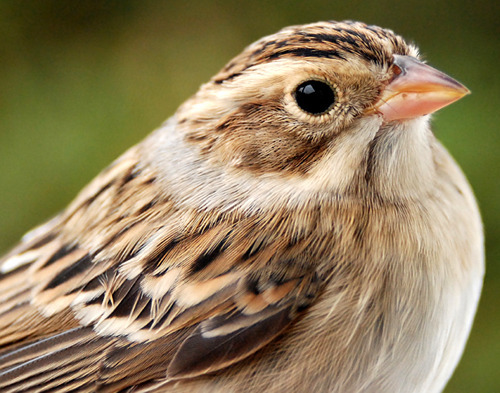 A rarity to Powdermill, this sparrow usually breeds in shrublands, field edges, and thickets across the northern prairies. 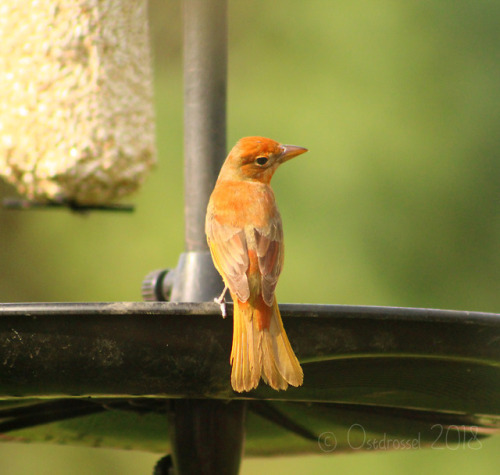 Powdermill Nature Reserve’s avian research center is part of Carnegie Museum of Natural History’s biological research station in Rector, Pennsylvania. The research center operates a bird banding station, conducts bioacoustical research, and performs flight tunnel analysis with the goal of reducing window collisions. I’m fighting a cold, but the year’s almost done and I’m tied for the top spot in the county-year eBird rankings. So I set the alarm and headed to River Park in Lompoc, where a Clay-colored Sparrow has been seen lately hanging out with the White-crowned Sparrows. I spent most of my time checking out a couple of different groups of White-crowns, trying hard to make one of them look smaller than the rest. No dice. My photo’s nowhere near as good as the OP’s. But it’s special to me. This could be my last county-year bird of 2018. I’ve got a few chances at a Northern Pygmy-Owl coming up, and there have been some Black and White-winged Scoters seen off Vandenberg not far from Surf Station; maybe I could see one of those. And there’s the method Nick explained a while back to scope for American Bitterns at Ocean Beach Park. Any of those could add another species to the list. And there’s always the chance of a wildcard. They’re birds; you can’t predict them. 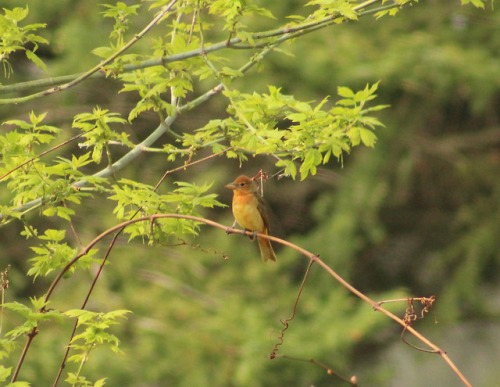 Again, no booth pics, but something amazing happened this morning – I had a Summer Tanager in my yard! 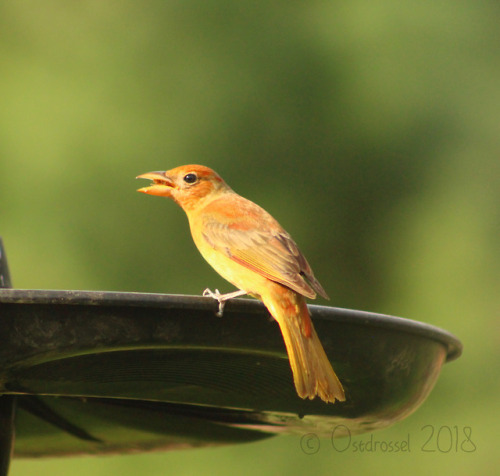 When I first saw him, I thought it was a weird female Cardinal or maybe a female Orchard Oriole (because I have never seen one before), but something did not add up. From what I am reading, their range normally does not even reach as far as Michigan, so this was such a cool surprise! What a spring this is! Right where it was supposed to be, eating persimmons at the Santa Barbara Museum of Natural History. 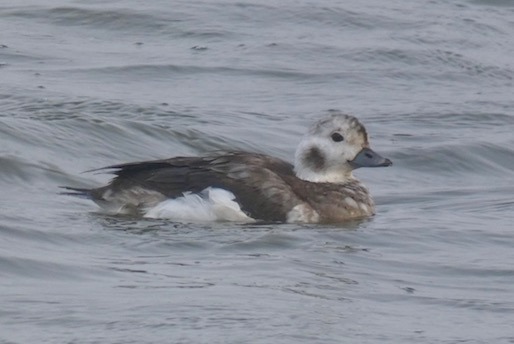 A female Long-tailed Duck was reported by Nick late Sunday afternoon from Ocean Beach County Park, just far enough away that I couldn’t get there before dark, and would very much not have wanted to anyway since it would have put me in Thanksgiving weekend traffic on the way back. And the next day (Monday) was my day to go the opposite direction to LA for work, so I had to cross my fingers and hope the bird would stay until today (Tuesday). 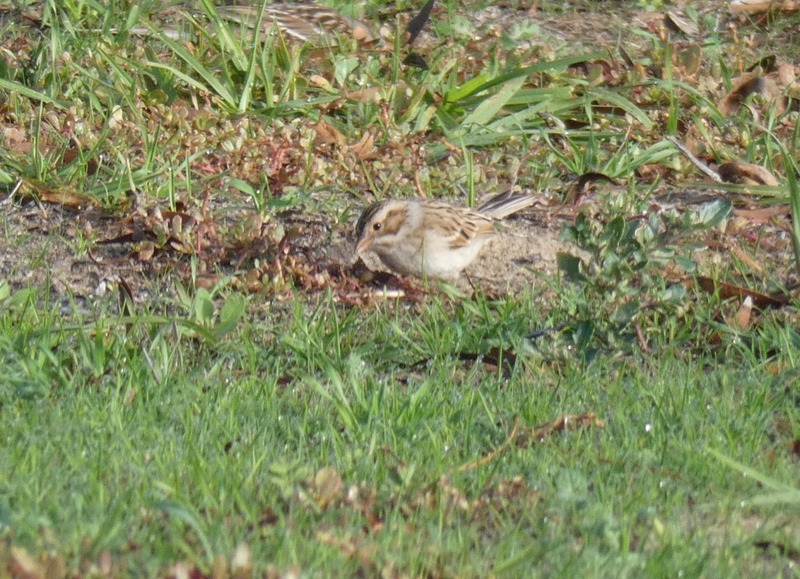 One eBird report by Libby on Monday showed the bird still there, so I was hopeful. I set the alarm for 4:30 and got there shortly after sunrise. It was cold, which wasn’t so bad, but also foggy and windy, which put a damper on things. I looked around the railroad bridge near the parking lot where the bird had been seen, sifting through the Ruddy Ducks and Eared and Western Grebes, but no dice. I walked to the beach and checked out the Snowy Plovers, then returned to the railroad bridge again, wiping condensation off my glasses. 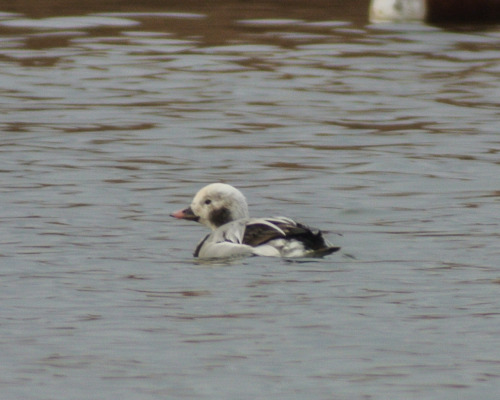 Still no Long-tailed Duck. Oh, well. Most chases don’t pan out; it looked like this was going to be one of those. I returned to my car and reviewed my eBird list. As I was about to drive away I noticed that the sun was starting to poke through, and I thought, well, maybe the duck has been tucked away somewhere waiting for it to get nicer out. So I took one last stroll down to the railroad bridge.